. كما يقدم Courtyard By Marriott Sydney-North Ryde Hotel الكثير من الخدمات لإغناء رحلتك في سيدني. يقدم هذا الفندق العديد من الخدمات الكفيلة بإرضاء أكثر الضيوف تطلباً. 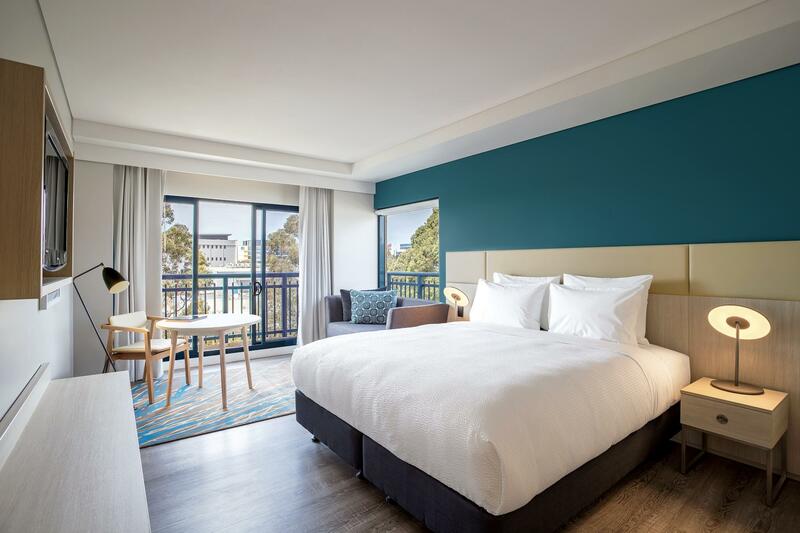 تنعكس أجواء Courtyard By Marriott Sydney-North Ryde Hotel في غرف الضيوف.تلفزيون بشاشة مسطحة, هاتف في الحمام, مناشف, إغلاق, اتصال لاسلكي بالإنترنت هي بعض الميزات الموجود في العديد من الغرف. إن مركز للياقة البدنية, مسار جولف - ضمن 3 كم هو المكان الأمثل في الفندق للاسترخاء وتفريغ طاقتك بعد نهار طويل. 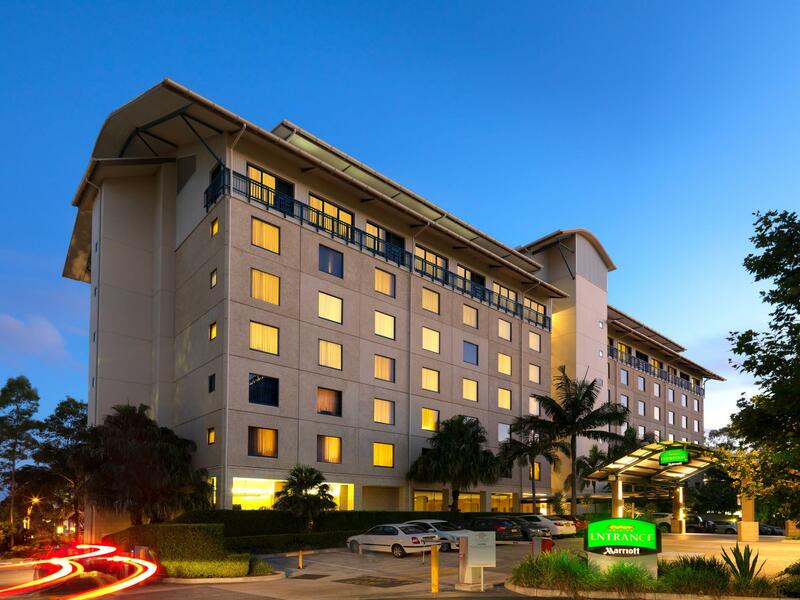 إن Courtyard By Marriott Sydney-North Ryde Hotel هو خيارك لخدمة الفنادق الراقية في سيدني. Room was clean. Everything was pretty ideal and basic but the parking was horrible. Was told would be $15 to park overnight, per night. No free parking was within a 10-15 minute walk which with 2 young kids wasn't going to happen. Parking ended up costing me $51 for the 1 day/night we were there. Very pricey and ridiculous. We’ve now stayed at this hotel and will definitely be back. Value for money, convenient location, great staff and the kids love the buffet breakfast! The location is quite good (if you have car) but parking should have been free (since it's not in city centre). Room is clean. But dark. Not enough light to read on the bed at night. Breakfast selection, however is good. It meets the standard requirement for a 4 star establishment. Cleanliness, appearance and the staff of the Courtyard is exceptional, the only negatives were you have to pay for daily parking inside the facility and the train station that is nearby is closed. Overall a very enjoyable time spent in Sydney. Stayed here to attend a concert at ANZ Stadium with our 15 & 17yo’s. Buses to Olypmic Park picked up/ dropped off out the front. Facilities are excellent. Staff very helpful and professional - nothing is too much trouble. Breakfast was excellent. Beds are outstandingly comfortable. Highly recommend. Great location. Close to public transport and major shopping Center. Clean hotel with great buffet breakfast. Downside is that they charge you to park on their property!!! Where else are guests suppose to park? I stayed in this hotel for my vacation this time. The staff in the hotel are very polite and helpful and they tried their best to meet the guests'needs. The breakfast is a bit expensive when compared to the qualities and varieties offered in hotels in other Asia countries where the food varieties are not much. The hotel room is comfortable and clean. the hotel is near macquarie university; the loft suite can accommodate four people and has 1 1/2 baths which is quite convenient; there is a coffee shop which offers daily buffet breakfast and lunch and beside the hotel is a very good ribs and steak restaurant which is open for lunch and dinner; right across the street is mcdonalds and kfc and to the right is a 7-11 outlet thereby giving one choices of what to eat. the hotel has a shuttle service to the surrounding areas from 7-10am daily. we would stay in this hotel should we be able to return in the near future.. Overall, a decent location on the outskirts of North Sydney. The hotel is quite clean and comfortable, the staff very accommodating to my needs. As compared to the prices in the city, this hotel was a real value and I would certainly stay here again. The onsite food and beverage choices were also quite nice, and reasonably priced. Overall, I would recommend this hotel to friends staying in the area and look forward to coming back to visit. staffs are friendly and helpful, room is nice and tidy. Close to shopping centre, easy to access restaurants and supermarket. My husband and I stayed here after my sisters wedding. We were upgraded to a superior king for free which was nice after a long day. The bed was comfortable for me, however the pillow was flat and not comfortable at all. The location is great and just up the road from the Macquarie Centre and MaccDonalds just a short walk away. Also, is close to the train station if wanting to travel into the city. All in all, was nice. My adult daughter and I relished our stay at Courtyard by Marriott. The beds were very comfortable, the room was clean, smart and quiet. It was well stocked with plenty of toiletries and excellent coffee/tea etc. The routine late checkout time of 12 midday made for a leisurely morning checkout. At reception iced water available on check-in and a lolly bag on checkout were pretty impressive bonuses! Heartily recommend this hotel. We were only passing through, so we really only required a clean, comfortable room and this hotel certainly provides that. It's located close to trains, buses and major shopping centers. The staff were professional and friendly, the bed was very comfortable, all needs were provided for. A welcome haven after an extended trip in South Asia! 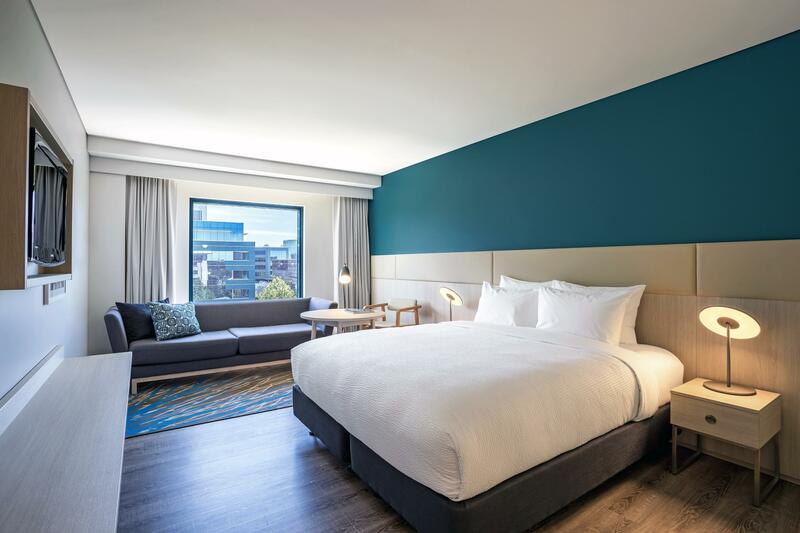 It's a very good alternative to the highly priced hotels of the inner city - clean, comfortable and large rooms, a good upscale hotel atmosphere, easy parking and planety of access to public transport. It was a comfortable stay. Nothing fancy or special, however rooms were clean, amenities such as heating/hot water/internet was fast and good. Staff were pleasant and the location was great (very near the train stop, so easy to get around). 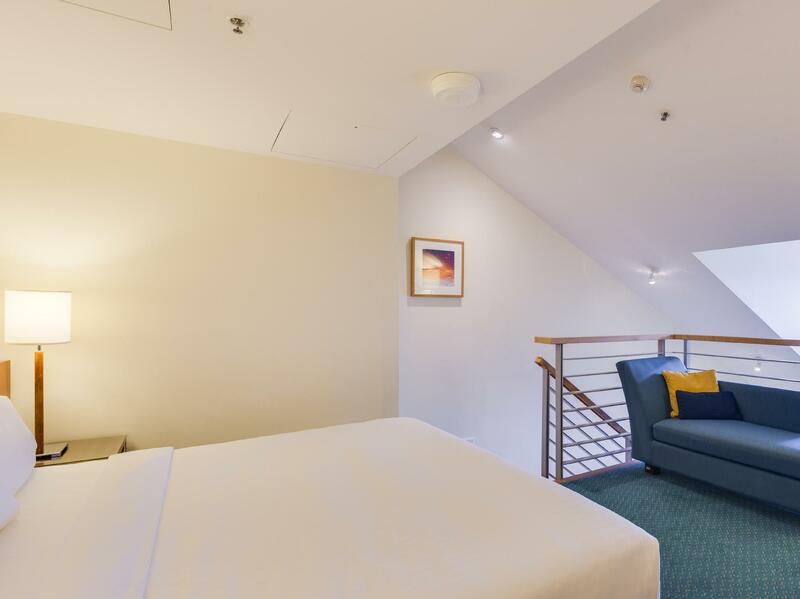 Probably the best business hotel in North Ryde close by to the businesses. Clean and Large rooms and very attentive staff. a small gym is available for a quick workout. close by to several restaurants so if you do not want to order room service, you can just walk across the road. price is on the high side. overall a positive experience and will come back again. I enjoy my last stay in this hotel so choose to stay again. The experience is good. The rooms are clean with all the facilities provided. You can park easily with no charge at all. As I am an customer before, they offered me free membership to enjoy the in room wifi for up to 7 devices. This save me time going to the reception area for wifi in public area. The staff are friendly and efficient the guest service manager who did not hesitate to entertain my request for late check out.